- We provide server hosting services. Our 15 years of experience in this field allows us to offer the best servers. Today, we support more than 30,000 dedicated servers and more than two million domains in our data centres in the US and Europe. Our main office is located in Germany. I am participating in this exhibition for the first time, and have noted the high level of its organization. I am pleased with everything and the exhibition has good vibes. 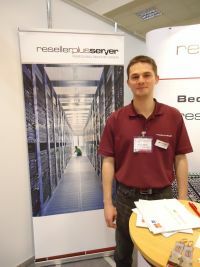 At the stand we aim to explain to visitors that Reseller.PlusServer uses only the most well-known proprietary hardware. All our server components meet strict manufacturing standards and quality control requirements. The company has a direct physical connection to the networks of leading telecoms operators. The reliability and speed of our Internet connection is guaranteed by the reservation of network connections, and excellent routing ensures an uninterrupted connection with the server at any time. The purpose of our participation in the exhibition is to establish connections and find customers. Our partners are mainly resellers. They offer server hosting services in the territory of Azerbaijan. We already have several customers in Azerbaijan, and I hope that this number will increase.